One of the big headlines of last year’s Space Symposium was Orbital ATK’s unveiling of a new rocket designed to challenge incumbents United Launch Alliance and SpaceX for future U.S. Air Force launch contracts. Dubbed OmegA, the vehicle had been secretly in the works for three years under the generic name “Next Generation Launch System.” The solid-propulsion OmegA was dreamed up by Orbital ATK before the company was acquired by Northrop Grumman. The reveal at the 34th Space Symposium happened just a few months before the acquisition of Orbital ATK was completed. OmegA’s chances of becoming a credible player in the National Security Space Launch program (NSSL) — formerly known as the Evolved Expendable Launch Vehicle program— got a boost in October when the Air Force awarded Northrop Grumman a $792 million Launch Service Agreement to share the cost of developing OmegA to carry military satellites. Launch Service Agreement (LSA) funding — also awarded to competitors United Launch Alliance and Blue Origin — is to be spread over five years to help the companies pay for the infrastructure and vehicle modifications that would be required for Air Force certification to fly national security missions. In the second phase of LSA, called the Launch Service Procurement, the Air Force plans to select two providers in 2020 to split 60/40 up to 25 launches over five years starting in 2022. The stakes could not be higher for OmegA as it prepares for two critical static-fire tests of its solid rocket motors this year with the goal to launch its first payload in 2021. Former NASA astronaut Kent Rominger is Northrop Grumman’s vice president for strategic programs. He spoke with SpaceNews about OmegA and its prospects. What’s happened since you unveiled OmegA year ago? We have been defining the details. Four years ago, when we talked to the Air Force about our plans and our schedule, we told them we would do the first static test fire in the second quarter of 2019. It’s on track for late May, and it is going to be exciting. In the solid rocket motor world, that is a qualifying test. OmegA has two solid boost stages and a cryogenic liquid upper stage powered by the Aerojet Rocketdyne RL10C engine. The May test is for the first stage. The static fire of the second stage is scheduled for August. We are pleased that we are holding our schedule. How is Northrop Grumman preparing for these critical tests? 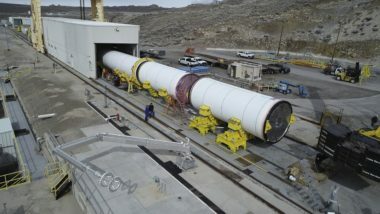 The completed OmegA first stage, which is more than 3.5 meters in diameter and nearly 24 meters long, is currently in the test stand where technicians are attaching instrumentation gauges and data recorders. During the static test, we will measure key characteristics such as thrust, pressure, strain, temperature, vibration and burn rate to validate expected performance. This stage will demonstrate more than two million pounds of thrust. Do you still plan to develop a heavy configuration? Yes. The first OmegA model will be an intermediate-class rocket that will fly payloads that currently use the Atlas 5 or the Falcon 9. Our intermediate variant is on track for first launch in 2021 and the heavy variant in 2024. The Air Force requires NSSL competitors to fly to nine reference orbits. Our intermediate rocket can reach seven of the nine. We need the heavy version to reach the other two. Does being the only competitor with a solid rocket give you an advantage? I believe so. The Air Force wants a diverse industrial base. Before the LSA award, Northrop Grumman and the Air Force already had invested more than $300 million in developing OmegA. They don’t want a launch monopoly any more. They also want to ensure they have reliable service to get national security payloads to orbit. OmegA was engineered with simple solid boosters and a proven upper stage with the RL-10 engine. We designed it for national security payloads to give them a benign, gentle ride. We maintain that the ideal rocket equation is solid on boost and a very efficient liquid engine upper stage where you don’t care so much about the thrust levels. What else do you think might give you an advantage in the NSSL competition? OmegA is different because of Northrop Grumman. If you look at the field of Launch Service Procurement competitors. we are the only company that isn’t just a rocket company. Our whole focus is national security, and certainly national security space. We are a dedicated government partner. Because of our production base and existing infrastructure, we could go down to a very low rate and still be successful, and we would keep our workforce employed across multiple programs. That is our biggest strength in this competition — being a big aerospace company dedicated to national security, we will be there no matter what. That said, what happens to OmegA if you don’t win a Launch Service Procurement award? If we don’t win LSP, we’re evaluating what we would do with OmegA. We’re watching those commercial markets to help determine that. I don’t have a definitive answer for you today. Depending on the outlook and other factors, we could easily decide to press on with OmegA. But there is a chance, too, depending on what we see, that we would decide at the time to not continue, or maybe put it on the shelf. As a former NASA astronaut and veteran of the space shuttle, how do you feel about efforts by SpaceX and Boeing to bring back human spaceflight to the United States? If we had had OmegA along sooner, we would have loved to have lifted either one of the capsules. The reliability of our system lends itself to human spaceflight. As a former NASA astronaut, I am pulling for the commercial crew folks to be very successful and get our astronauts into space from U.S. soil as soon as possible.